Vineet Edupuganti, a senior at Oregon Episcopal School in Portland, OR, won the $100,000 grand prize in the Individual category for developing a biodegradable battery that can power ingestible medical devices that can track and diagnose conditions that affect internal organs. 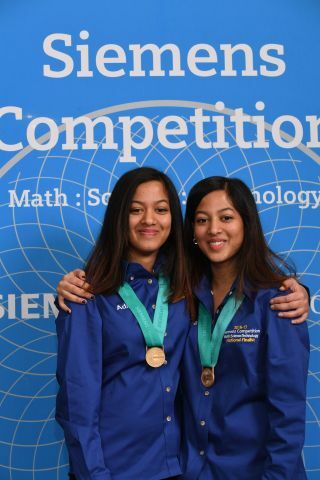 Identical twin sisters Adhya Beesam and Shriya Beesam, both juniors at Plano East Senior High School in Plano, TX shared the $100,000 grand prize in the Team category for their work developing a new approach to diagnose schizophrenia earlier in patients with higher certainty using both brain scans and psychiatric evaluations. This year’s Siemens Competition winners, Vineet, Adhya and Shriya have demonstrated a drive and creativity that is truly awesome," said David Etzwiler, CEO of the Siemens Foundation. "These scholars are poised to transform the lives of millions around the globe by helping us advance medical knowledge and technologies designed to diagnose and treat various diseases. I cannot wait to see where their dedication and innovative thinking will lead them and the rest of us as well." The 2016 Siemens Competition awards were presented at The George Washington University in Washington, DC, host of this year’s national finals event. 19 high school competitors – winnowed down from an original pool of more than 2,000 – were judged on their research in topics that addressed issues ranging from Alzheimer’s disease to levitating cars, and from cancer to planets outside our solar system. More than 1,600 projects were submitted for the competition this year in areas of computer science, physics, chemistry, mathematics, materials science, environmental science, biochemistry, biology, and engineering. 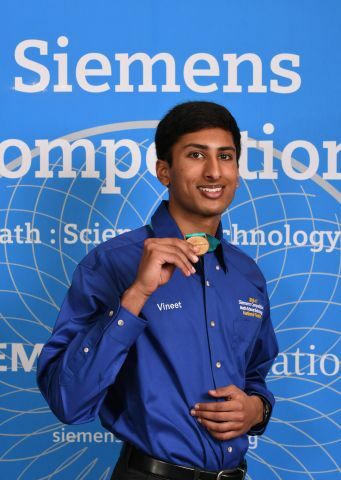 Vineet Edupuganti, a senior from Oregon Episcopal School in Portland, OR, won the individual category and a $100,000 scholarship for his project entitled, "Development of a High-Performance Biodegradable Battery for Transient Electronics." Vineet’s work could simplify how medical practitioners diagnose conditions that affect internal organs. He developed a biodegradable battery that can power ingestible medical devices. The battery dissolves after the device has served its purpose, which means it can be swallowed without causing harm to the human body. This technology can be used to power medical devices that track and diagnose conditions that affect internal organs, like gastrointestinal disorders, which currently require complex imaging or invasive procedures to diagnose. Vineet is an aspiring entrepreneur who would like to find real-world applications for research that he can eventually take to market. He is fascinated by the newly-emerging field of biodegradable electronics because he sees its potential to affect change in a wide array of industries. Vineet received a third place grand award at the Intel International Science and Engineering Fair in 2015 and 2016. He plays classical piano, guitar and tennis. Vineet’s mentor is Dr. Raj Solanki, Professor of Physics at Portland State University. Adhya and Shriya dedicated themselves to research better ways to diagnose schizophrenia after watching an uncle struggle with mental illness and several misdiagnoses before being diagnosed with schizophrenia. Eventually, they lost their uncle to suicide. Driven by the desire to help others be more quickly diagnosed and access better mental health treatment earlier, they taught themselves about schizophrenia and methods of diagnosing this illness. The diagnosis of schizophrenia has historically been based largely on psychiatric evaluations—which are primarily based on observation and conversations—and ruling out other possible diagnoses. The development of tests, such as MRIs or CT scans have accelerated testing, but integrating these two approaches offered hope for faster, more accurate diagnosis. Armed with this knowledge, they developed a computer program that would analyze the results of both quantitative (MRI) tests and qualitative tests (psychiatric evaluation by a professional, known as Positive and Negative Syndrome Scale – PANNS.) Adhya and Shriya combined an approach known as “fuzzy logic,” with another method known as “neural networks” to combine the information in the brain scans and psychiatric evaluations in an intelligent manner that results in remarkably accurate results. The Beesams’ approach also has the potential to improve the diagnosis of many other brain disorders and diseases, such as Alzheimer’s disease and multiple sclerosis. The Beesam sisters did not have an official mentor but had support from Julie Baker, a teacher in the Biology department at Plano East Senior High School. 2,146 students (1271 individuals, 304 2-person teams and 89 3-person teams) submitted applications from 46 states plus the District of Columbia and 7 countries with more than 1,600 projects submitted for consideration. For more details go to: http://siemensusa.synapticdigital.com/US/Siemens-Foundation. Follow us on Twitter @sfoundation (#SiemensComp) and like us on Facebook at Siemens Foundation. Description of this year's $100,000 national winners of the 2016 Siemens Competition in Math, Science and Technology.